In the 2016 season, Paul Posluszny posted a career-best PFF grade of 88.4, which ranked fourth amongst all linebackers. 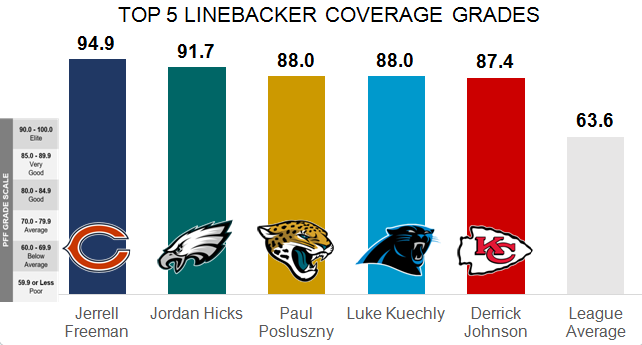 Posluszny thrived best in coverage, as his grade of 88.0 was tied for third among all linebackers. Playing the fifth-most coverage snaps among inside linebackers, he allowed just 0.76 yards per coverage snap in 2016. That figure was 11th out of 57 eligible inside linebackers. One area where Posluszny really improved in 2016 was as a pass-rusher. He recorded 14 quarterback hurries, which was tied for first amongst inside linebackers. Prior to 2016, Posluszny’s career-high in hurries was six. With 17 total QB pressures on 79 pass-rushing snaps, he ranked ninth out of 57 inside linebackers in PFF’s pass-rushing productivity metric. Some outlets project Posluszny moving to the outside to make room for Myles Jack in 2017, but with those two and Telvin Smith slated to start, the Jaguars’ linebacker corps should be considered a strength for a defense that has its fair share of potential.